Rugby Australia have moved the former out-half to a new role just over seven months before the Wallabies begin their World Cup campaign. Larkham pictured ahead of Australia's 2015 World Cup win over England in Twickenham. 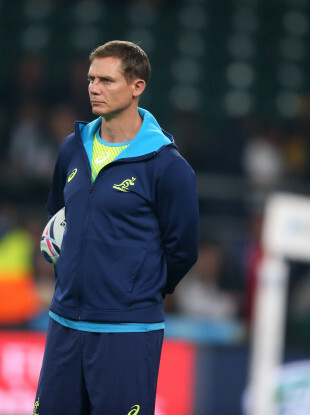 STEPHEN LARKHAM WAS axed as Wallabies assistant coach this morning Monday after disagreements with Michael Cheika over strategy and game philosophy just over seven months their World Cup kick-off in Japan. Rugby Australia said he will move to a new role as national high performance coach advisor, focusing on mentoring and skills development across the Sevens and junior teams. Larkham, a former World Cup-winning fly-half, said he was “disappointed”. “Ultimately Michael is responsible for the performance of the team,” he said of head coach Cheika. “I am obviously disappointed with this outcome as I had chosen to pursue the experience of taking the Wallabies through to the World Cup,” he added. The move comes less than two months after Cheika himself survived the chop and had his powers curtailed over an alarming slide in the team’s form. From March, he will have to report to Scott Johnson in his newly-created role of director of rugby. Cheika must also now work with a three-man selection panel. The move followed a mounting backlash from dismayed fans and former players after the Wallabies won just four of their 13 Tests last year — their worst campaign in decades. Rugby Australia chief executive Raelene Castle said she was glad Larkham was staying on in another role. “He was one of our greatest ever Wallabies and has developed a strong depth of experience during his coaching roles with the Brumbies and Wallabies,” she said. Email “Australia pull Larkham from attack coach role after Cheika row”. Feedback on “Australia pull Larkham from attack coach role after Cheika row”.